Movie Review: “Danny Collins” starts by saying that what we’re going to watch is ‘kind of based on a true story a little bit’. Dan Fogelman, known for writing screenplays for animated movies (“Bolt”, “Tangled”) and expendable comedies (“Crazy, Stupid, Love”, “Last Vegas”), directs for the first time, inspired by the life of folk singer Steve Tilston and relying on experienced actors such as Al Pacino, Anette Benning and Christopher Plummer, who were joined by Jennifer Garner and Bobby Cannavale. Mr. Pacino plays the title character with geniality, modeling an aging pop-rock singer who was predestinated to be rich and famous, but whose career is stagnant and life has degenerated into a spiral of drugs and alcohol abuse for more than 30 years. Although Collins admires himself, enjoying his popularity, he’s not completely fulfilled. When his best friend and longtime manager, Frank (Plummer), uncovers a letter written many years ago by John Lennon, Danny gets deeply touched and decides to change his way of living. Entrusting his unfaithful young fiancé to her lover, he travels to New Jersey to find Tom (Cannavale), the son he had never met, who pushes him away. However, the support of Tom’s wife and the help he provides to his hyperactive granddaughter by enrolling her in a special school, will bring the opportunity of reconciliation that he was wishing for. Simultaneously, the musician uses his charm and spirited lines to seduce Mary (Benning), the manager of the Hilton hotel where he’s staying, who keeps resisting to his invitation to dinner despite the chemistry that protrudes between them. The direction by Mr. Fogelman wasn’t ideal, transforming the story into a mushy drama that feels flat for most of the time. Nonetheless, he was able to set up one of the greatest humane finales I’ve seen lately. 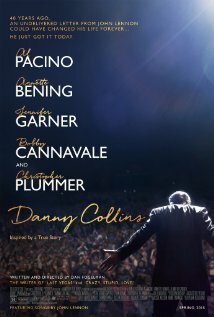 After “Stand Up Guys” and “The Humbling”, “Danny Collins” reinforces the aging theme as a persistent constituent of Al Pacino’s agenda.